This article is about historical markers in the United Kingdom. For equivalent markers elsewhere, see Commemorative plaque. A blue plaque is a permanent sign installed in a public place in the United Kingdom and elsewhere to commemorate a link between that location and a famous person, event, or former building on the site, serving as a historical marker. The term is used in the United Kingdom in two different senses. It may be used narrowly and specifically to refer to the "official" scheme administered by English Heritage, and currently restricted to sites within Greater London; or it may be used less formally to encompass a number of similar schemes administered by organisations throughout the UK. The "official" scheme traces its origins to that launched in 1866 in London, on the initiative of the politician William Ewart, to mark the homes and workplaces of famous people. It has been administered successively by the Society of Arts (1866–1901), the London County Council (1901–1965), the Greater London Council (1965–1986) and English Heritage (1986 to date). It remains focused on London (now defined as Greater London), although between 1998 and 2005, under a trial programme since discontinued, 34 plaques were erected elsewhere in England. The first such scheme in the world, it has directly or indirectly provided the inspiration and model for many others. Many other plaque schemes have since been initiated in the United Kingdom. Some are restricted to a specific geographical area, others to a particular theme of historical commemoration. They are administered by a range of bodies including local authorities, civic societies, residents' associations and other organisations such as the Transport Trust, the Royal Society of Chemistry, the Music Hall Guild of Great Britain and America and the British Comic Society. The plaques erected are made in a variety of designs, shapes, materials and colours: some are blue, others are not. 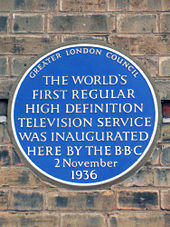 However, the term "blue plaque" is often used informally to encompass all such schemes. There are also commemorative plaque schemes throughout the world such as those in Paris, Rome, Oslo, Dublin; and in other cities in Australia, Canada, the Philippines, Russia and the United States. The forms these take vary, and they are more likely to be known as commemorative plaques or historical markers. In 1921, the most common (blue) plaque design was revised, as it was discovered that glazed ceramic Doulton ware was cheaper than the encaustic formerly used. In 1938, a new plaque design was prepared by an unnamed student at the LCC's Central School of Arts and Crafts and was approved by the committee. It omitted the decorative elements of earlier plaque designs, and allowed for lettering to be better spaced and enlarged. A white border was added to the design shortly after, and this has remained the standard ever since. No plaques were erected between 1915 and 1919, or between 1940 and 1947, owing to the two world wars. The LCC formalised the selection criteria for the scheme in 1954. Other schemes have different criteria, which are often less restrictive: in particular, it is common under other schemes for plaques to be erected to mark the sites of demolished buildings. English Heritage's in-house historian researches the proposal, and the Blue Plaques Panel advises on which suggestions should be successful. This is composed of 9 people from various disciplines from across the country. The panel is chaired by Professor Ronald Hutton, and includes former Poet Laureate Professor Sir Andrew Motion and buildings historian Professor Gavin Stamp. The actor and broadcaster Stephen Fry was formerly a member of the panel, and wrote the foreword to the book Lived in London: Blue Plaques and the Stories Behind Them (2009). The Essex town of Loughton inaugurated a scheme in 1997 following a programme allowing for three new plaques a year; 42 had been erected by 2019. The aim is to stimulate public interest in the town's heritage. Among the Loughton blue plaques is that to Mary Anne Clarke, which is in fact a pair of identical plaques, one on the back, and one on the front, of her house, Loughton Lodge. In 2017 in Aldershot in Hampshire the Aldershot Civic Society unveiled its first blue plaque to comedian and actor Arthur English at the house where he had been born. It is intended that this will be the first in a series dedicated to notable local people or historic buildings. The Transport Trust's Red Wheel scheme erects red plaques on sites of significance in the evolution of transport. 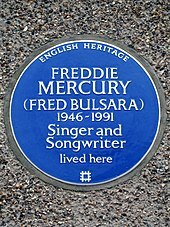 The Music Hall Guild of Great Britain and America erects blue plaques on sites associated with notable music hall and variety artistes, mainly in the London area. The British Comedy Society (previously known as the Dead Comics' Society) erects blue plaques on the former homes of well-known comedians, including those of Sid James and John Le Mesurier. The Royal Society of Chemistry's Chemical Landmark Scheme erects hexagonal blue plaques to mark sites where the chemical sciences are considered to have made a significant contribution to health, wealth, or quality of life. In the United States, commemorative plaques similar to those used in Europe are called historical markers. These vary in colour and design by state. The National Trust for Historic Preservation or the U.S. government, through the National Register of Historic Places, can bestow historical status, with a small bronze marker affixed to the building. Other markers are erected by state historical commissions and similar authorities, local governments or civic groups. These can also be affixed to the building, but are frequently free-standing markers with the text on each side, or, in larger instances, beginning on one side and continuing to the other. The Philippines have more than 1,500 historical markers installed for numerous personalities, places, structures, and events around the country. There are also a number of ones installed outside the country. The government agency tasked for this is the National Historical Commission of the Philippines (NHCP), although local government units can also install markers of local significance. The policy of installing markers started in 1933. The initial markers were placed in 1934. ^ a b c Spencer, Howard (2008). "The commemoration of historians under the blue plaque scheme in London". Institute of Historical Research. Retrieved 16 June 2011. ^ a b c d e f "The History of Blue Plaques". English Heritage. Retrieved 16 December 2017. ^ "Built to last: the making of a blue plaque". English Heritage. Retrieved 16 December 2016. ^ "Blue Plaque FAQS". English Heritage. Retrieved 15 March 2013. ^ "Getting back to where she once belonged: Yoko Ono unveils blue plaque at John Lennon's London home". Daily Mail. London. 23 October 2010. Retrieved 7 July 2011. ^ a b "About blue plaques". Royal Borough of Kensington and Chelsea. Retrieved 16 June 2011. ^ a b "The Blue Plaque Design". English Heritage. Retrieved 16 June 2011. ^ a b Quinn, Ben (6 January 2013). "Blue plaques scheme suspended after 34% cut in government funding". The Guardian. London. Retrieved 7 January 2013. ^ Plaque #473 on Open Plaques. ^ Plaque #136 on Open Plaques. ^ Plaque #604 on Open Plaques. ^ "Blue Plaques scheme position statement". 8 January 2013. Retrieved 15 March 2013. ^ Gray, Louise (7 January 2013). "National Trust could save blue plaques". The Daily Telegraph. London. ^ "London Blue Plaques Re-Open For Nominations – 18 June 2014". English Heritage. Retrieved 27 June 2014. ^ a b c "Propose a plaque". English Heritage. Retrieved 16 December 2016. ^ "How to propose a Blue Plaque". Retrieved 7 July 2011. ^ "Blue Plaques Panel". English Heritage. Retrieved 10 February 2015. ^ Parker, Peter (11 July 2009). "Lived in London: Blue Plaques and the Stories Behind Them by Emily Cole: review". The Daily Telegraph. London. Retrieved 7 July 2010. ^ Plaque #517 on Open Plaques. ^ Plaque #1412 on Open Plaques. ^ "About Blue Plaques: Frequently Asked Questions". English Heritage. Archived from the original on 17 May 2015. Retrieved 13 May 2015. ^ a b "Register of Plaque Schemes". English Heritage. Retrieved 16 July 2012. ^ "Blue plaques". City of London. Retrieved 19 May 2015. ^ "Green Plaques Scheme". Archived from the original on 16 July 2012. Retrieved 7 July 2011. ^ "Blue Plaque Winners 2007". Southwark Borough Council. Archived from the original on 13 September 2008. ^ "Recent Plaques". London Borough of Islington. Archived from the original on 22 March 2015. Retrieved 19 May 2015. ^ "THe Ulster History Circle". Retrieved 7 July 2011. ^ "Poet and broadcaster remembered". 8 February 2011. Retrieved 7 July 2011. ^ "Birmingham Civic Society plaques list". Retrieved 12 January 2013. ^ "Birmingham Civic Society Awards". Retrieved 29 November 2011. ^ a b "Commemorative Plaques". Manchester City Council. Retrieved 7 July 2011. ^ "Commemorative plaques scheme". Manchester Art Gallery. Retrieved 17 April 2016. ^ "The Portuguese gave us fried fish, the Belgians invented chips but 150 years ago an East End boy united them to create The World's Greatest Double Act". Daily Mail. Retrieved 21 September 2011. ^ "Blue Plaques in Bournemouth". Retrieved 7 July 2011. ^ "Blue Plaques of Bournemouth". Bournemouth Borough Council. ^ "The history of Berkhamsted". Berkhamsted Town Council. Retrieved 6 May 2011. ^ Cook, John (2009). A Glimpse of our History: a short guided tour of Berkhamsted (PDF). Berkhamsted Town Council. Archived from the original (PDF) on 27 September 2011. Retrieved 6 May 2011. ^ "Blue Plaques". Wolverhampton Civic and Historical Society. Retrieved 5 November 2012. ^ "Loughton Blue Plaques" (PDF). Retrieved 9 August 2016. ^ "Blue plaque link to town's famous faces". Malvern Gazette. Newsquest Media Group. 21 October 2005. Retrieved 25 June 2011. ^ "Plaque a tribute to Narnia author". Malvern Gazette. Newsquest Media Group. 21 July 2006. Retrieved 25 June 2011. ^ "Emperor will be remembered as part of civic week". Malvern Gazette. Newsquest Media Group. 6 June 2011. Retrieved 25 June 2011. ^ "Final vote for Derbyshire blue plaque honour". BBC News. 25 April 2010. Retrieved 6 May 2011. ^ "Blue Plaques". Derbyshire County Council. Retrieved 6 May 2011. ^ "Commemorative Plaques". Gateshead Council. 2012. Retrieved 29 December 2012. ^ Richards, Linda (9 September 2010). "Blue Plaques mapshows off famous spots". Newcastle Evening Chronicle. Retrieved 29 December 2012. ^ "Plaque honours famous ex-resident". the BBC. 15 June 2005. Retrieved 29 December 2012. ^ "Fairytale mansion gets new life". BBC. 14 July 2004. Retrieved 29 November 2012. ^ "Gateshead Blue Plaques – Joseph Swan 1828–1914". Gateshead Libraries. 2011. Archived from the original on 27 January 2013. Retrieved 29 December 2012. ^ Lawson, Ruth (8 March 2011). "Gateshead newspaper founder honoured". Newcastle Evening Chronicle. Retrieved 29 December 2012. ^ Richards, Linda (23 March 2011). "Blue plaque marks Victorian medic's home". Newcastle Evening Chronicle. Retrieved 29 December 2012. ^ Richards, Linda (23 June 2011). "Blue plaque honour to Sister Winifred Laver". Newcastle Evening Chronicle. Retrieved 29 December 2012. ^ Wainwright, Martin (21 March 2012). "Gateshead honours an engineering giant whose genius has lessons for our times". The Guardian. London. Retrieved 29 December 2012. ^ "Felling Pit Disaster remembered on 200th anniversary". the BBC. 25 May 2012. Retrieved 29 December 2012. ^ "Transport Trust". Archived from the original on 7 June 2010. Retrieved 7 July 2010. ^ "Connecting Everyone with Chemistry". Royal Society of Chemistry. ^ "Keith Moon plaque unveiling". Archived from the original on 29 April 2011. Retrieved 18 June 2011. ^ "Plaques by Country". Retrieved 7 July 2011. ^ "Blue Plaques". Department of Planning and Community Development, Victoria. Archived from the original on 25 February 2011. Retrieved 14 February 2011. ^ "Historical Plaques Program". Mechanics' Institutes of Victoria Inc. Retrieved 13 January 2013. Ito, Kota (2017). "Municipalization of memorials: progressive politics and the commemoration schemes of the London County Council, 1889–1907". London Journal. 42: 273–90. The London Borough of Southwark in South London, England forms part of Inner London and is connected by bridges across the River Thames to the City of London. It was created in 1965 when three smaller council areas amalgamated under the London Government Act 1963. All districts of the area are within the London postal district. It is governed by Southwark London Borough Council. Malvern Town Hall is the former town hall of the municipality of Malvern in the state of Victoria, Australia. It is the seat of the local government area of the City of Stonnington. Since the birth and expansion of the Scout movement in the first decade of the 20th century, many Scouting memorials, monuments and gravesites have been erected throughout the world. Herbert Collins (1885–1975) was a British architect, born in Edmonton, London. He designed many of the suburban developments in the city of Southampton in the 1920s and 1930s. 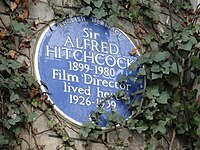 This list of blue plaques is an annotated list of people or events in the United Kingdom that have been commemorated by blue plaques. The plaques themselves are permanent signs installed in publicly visible locations on buildings to commemorate either a famous person who lived or worked in the building or an event that occurred within the building. Stockport Heritage was formed by volunteers in 1987 as a campaigning conservation group to help preserve and regenerate historic and architecturally sensitive buildings in the Metropolitan Borough of Stockport, Greater Manchester, England. Sir George Laurence Gomme, FSA was a public servant and leading British folklorist. He helped found both the Victoria County History and the Folklore Society. He also had an interest in old buildings and persuaded the London County Council to take up the blue plaque commemorative scheme. The Nelson Garden, on 13 Chippenhamgate Street, at the rear of No.18 Monnow Street, Monmouth, Monmouthshire is a 19th-century garden that was the scene of a tea party held to honour Lord Nelson in 1802. The garden is one of 24 sites on the Monmouth Heritage Trail. It is bounded on the south by the line of the medieval town wall through which it is entered via a short underground passageway. The garden is open to the public between April and September on Friday 2–4 p.m.
Windy Nook is a village in Tyne and Wear, England, bordered by Carr Hill to the west, Leam Lane Estate to the east, Felling to the north and Sheriff Hill to the south. It lies on steep, sloping land 2.25 miles (3.62 km) south of Gateshead, 2.75 miles (4.43 km) south of Newcastle upon Tyne and 12 miles (19 km) north of Durham. In 2011, the Windy Nook and Whitehills ward had a population of 9,781. Formerly part of Heworth, it was incorporated into the newly formed Metropolitan Borough of Gateshead on 1 April 1974. A long-running blue plaque scheme is in operation in Gateshead, Tyne and Wear. Administered by the local council, the scheme was registered with English Heritage in 1970 and 21 blue plaques were installed from the inception of the scheme until 1996. Although the scheme was never formally closed, only one further plaque was then unveiled prior to the presentation of a 'report to cabinet' on 16 November 2004 which recommended that the scheme be revived. Seven further plaques were installed prior to the publication of a commemorative council document in 2010, bringing the total to 29, though a number of further plaques have been installed since that date. This is a complete list of the 177 blue plaques placed by English Heritage and its predecessors in the Royal Borough of Kensington and Chelsea. The Princes Gardens is an urban park in the town of Aldershot in Hampshire. A short walk from the town centre on a site bordered by the town's High Street, Wellington Avenue and Barrack Road and opposite the Princes Hall theatre, it has been a public park since 1930. Today the park is managed by Rushmoor Borough Council. St Michael Cornhill War Memorial is a First World War memorial by the entrance to the church of St Michael Cornhill, facing Cornhill in the City of London. The memorial became a Grade II* listed building in December 2016 ; the church itself is Grade I listed. Commemorative plaques in Merseyside, England, can be found across the region, highlighting notable people, buildings or historic sites. Many of the plaques are issued by authoritative bodies such as a council or a historical society that has a special interest.